After all the cooking I have been doing with Rex I thought I had better find something to do with Carys! 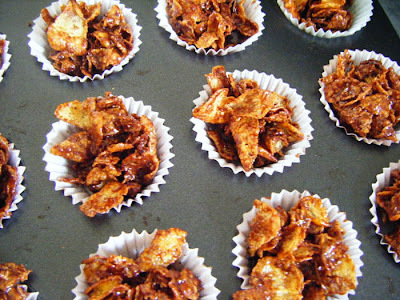 Having just watched Nigella Feasts on the tv we decided that the chocolate crackles looked just the thing! It was also lucky that I had just bought the book Feast: Food That Celebrates Life so had the recipe to hand! This is the absolutely easiest thing to make with a preschooler, she was able to get really stuck into it, from putting the muffin cases into the tins to sprinkling the sprinkles on at the last. As Nigella says, these are too easy to eat and I had to put them in the spare fridge in the garage to give them a chance of setting, or we would have been too tempted! I must say that I added extra chocolate as I felt that the prescribed amount wasn't going to be enough, so I added in about 50g of extra dark chocolate. 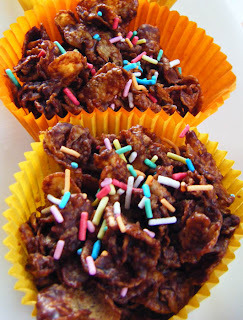 We made these again a few days later using rice bubbles, and this time using a mars bar and a small bar (about 60g) of caramello chocolate. They were also lovely! 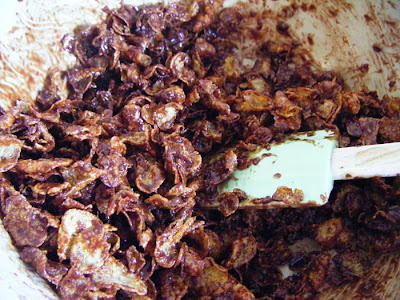 Chop the Mars Bars into bits and put into a saucepan with the butter. Melt, over a low heat, stirring frequently with a rubber spatula. 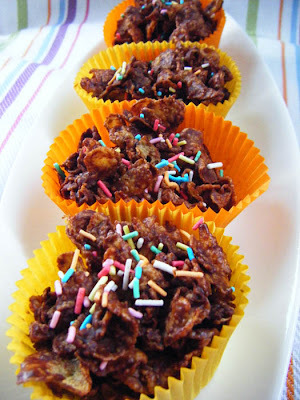 When everything is melted, tip in the cornflakes and turn them with your rubber spatula until they are totally coated. Fill muffin cases with the mixture and put in the fridge to set for at least an hour. 'Feast' is my absolute favourite cook book EVER! How sweet that you can share something so enjoyable with your little one!